Gandhi had announced that his party would ensure "minimum income guarantee" for every poor person in the country if voted to power in the upcoming Lok Sabha polls. RAIPUR/NEW DELHI: In what was seen as a masterstroke, Congress president Rahul Gandhi on Monday promised a Minimum Income Guarantee scheme for the poor, if voted to power in the forthcoming Lok Sabha elections. The mega welfare scheme would be an extension of the slew of pro-poor entitlement regimes created during the previous UPA government in the form of the right to information, farmer loan waiver, land acquisition Act, rural employment guarantee scheme MGNREGA, right to education and right to food. 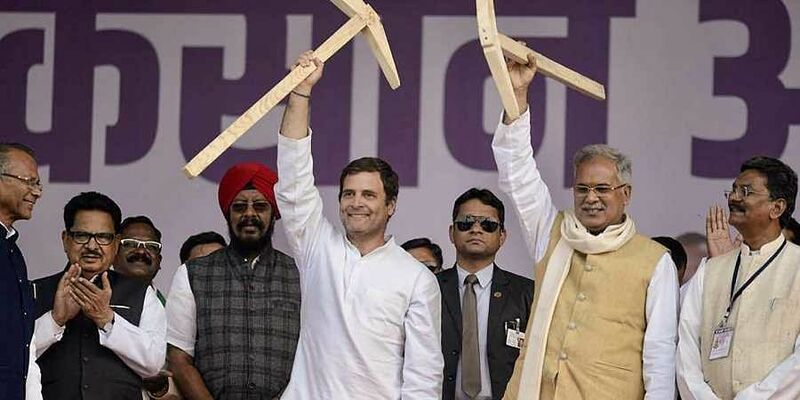 The big announcement came in Raipur, where Rahul handed over the promised loan waiver certificates to farmers and slammed Prime Minister Narendra Modi for creating two Indias — one for a few rich people like Ambani, Nirav and Mallya - and the other for the poor and farmers. “We have decided to come up with an initiative that no government across the world has ever done. The Congress after forming government will offer guarantee on minimum income in their bank accounts. No one will remain hungry or poor,” Rahul said. The concept of UBI or universal basic income floated by former chief economic adviser Arvind Subramanian was part of the 2016-17 Economic Survey and was discussed by the NDA government for the past two years. But it felt India is a nation of vast income disparities and funding such a welfare scheme would need huge funds. Poverty line or the estimated minimum income needed to sustain life was fixed at Rs 7,620 per person/annum, based on economist Suresh Tendulkar’s poverty line formula. The survey had estimated that such a model of UBI will cost 4.9% of India’s GDP as compared to 5.2% of GDP spent on all 950 Central sector and Centrally sub-sponsored schemes. A senior NITI Aayog member said the government would require budgetary support of Rs 1 lakh crore for implementation. Former finance minister P Chidambaram said the time had come to adapt the principle to “our situation and needs” and implement it. Noting the “poor of India have the first claim on the resources of the country” Chidambaram said “the Congress will find the resources to implement the promise of Rahul Gandhi.”He recalled how 140 million people were lifted out of poverty by the UPA from 2004 and 2014. Rahul slammed the previous Raman Singh government in Chhattisgarh asking why it failed to attend the needs of farmers and the Centre for diluting land acquisition law and “instructing BJP ruled states not to implement it as promulgated doing the UPA regime”. Chhattisgarh, he said, will implement the UPA’s version of the land takeover law. “If the land is being taken away, it would be only after due consent, the approval of panchayats and on suitable compensation. And if industries fail to install their project within five years of land acquisition, the same land will be returned to farmers” Rahul added. The move may prove a spoiler to the BJP as sources had claimed that the government was planning to announce a similar scheme in the upcoming budget. The TMS had reported on December 17 that the government is turning its focus back to rural distress and disenchanted small traders in a bid woo them back with financial packages and Universal Basic Income (UBI). By taking the individual, and not the household, as the unit of beneficiary, UBI can also empower women within households.